Please join us Thursday Feb. 12 from 6 to 7 for tasting of Wind Rose Cellars wine and assorted chocolates. Cost is $5— but it will be deducted from your $20 purchase of wine and/or chocolate. Perfect time to pick up some treats for the special folks in your life. Just two days until Valentines. See the end for a recipe from Wind Rose. By the way there is a pancake breakfast on Sat. Feb 14 (8 am to 11 am) put on by the Lions that is a fund raiser for the Ruby Jean Murray Scholarship Endowment. Come have a good breakfast prepared by the Lions, see what is in the silent auction and donate to a good cause. Your contributions will go twice as far because there is up to $5000 available as matching funds, Eat, see friends and help Quilcene senior go to college for many years to come. Give a valentines gift to the whole town by helping our students. Hope that you have been in and seen the new location for the alcohol and the new produce we are adding. We are committed to local and organic when possible, and if not available at at reasonable price, we get you the best we can find. We have cauliflower now ( plus broccoli, carrots, salad greens etc.) We will be getting Serendipity salad greens as soon as they are available (maybe next month)–but do have their great salad dressings and non local organic salad greens. My favorite way to cook cauliflower has been to brown it in butter and olive oil. But recently I have have modified how I fix it—6 minutes to cook–max. In a large skillet add about two Tablespoons of water, enough cut up cauliflower and carrot pieces (baby carrots or inch long pieces) as you all will eat, The veggies should be in a single layer! COVER and cook for about 3 minutes. If you have added the right amount of water it will be all gone–if some remains, drain it off. Add a spritze or a Tablespoon or so of olive oil (or as much of what ever type of oil/butter) , and turn heat to high again, leave lid off and cook for about 3 minutes, stirring once or so….should get some gentle browning on both the carrots and cauliflower. Now I don’t like much salt and Tom doesn’t like herbs on his so I dish out the veggies and add some chopped green onion and cilantro to mine and let him salt his. (Mine is much prettier!) Fast, fresh, healthy and very tasty. Now back to Wind Rose. This recipe is from their website. http://www.windrosecellars.com/ I have not made it but it sounds wonderful. > Mix together chopped thyme leaves, orange juice and 2 tablespoons olive oil in container with lid large enough to hold the salmon fillets in a single row. > Place fillets in marinade, turn several times to insure good surface coverage. > Cover and place in the refrigerator for at least 30 minutes or more. > Turn fillets at least once while marinating. > Mix together salsa ingredients in small bowl, cover and refrigerate until serving time. > Grill fish on indirect heat about 8-10 minute till fillets press lightly when touched and just begin to flake in the center. Do not overcook because the fish will continue to cook when it is taken off the heat. Brush fish with marinade several times while cooking and cover grill . Either coals or gas grill can be used but my preference is coal because it gives a soft smoky flavor to the salmon that seems perfect with Wind Rose Cellars Rosato. > Serve with spoonfulls of salsa across the salmon and on the side. Buon Appetito!! Wind Rose Cellars Wine Tasting on Thursday, February 12, 6 to 7 PM! 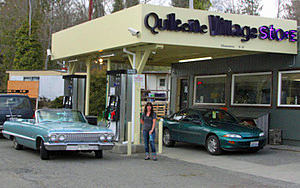 Quilcene Village Store has a new cooler by the front counter and it is filled with a great assortment of “grab and go” food —sandwiches, bagels, cream cheese, cheddar cheese, fruit, cookies etc. Check it out. Let us know if you want something added and we will try to get it for you. Valentines Day is coming and we are ready to help you enjoy the day. We have a selection of great cards including humorous ones as well as lovely and sweet ones. We have a great selection of chocolates including some just for the occasion and wine for every taste. 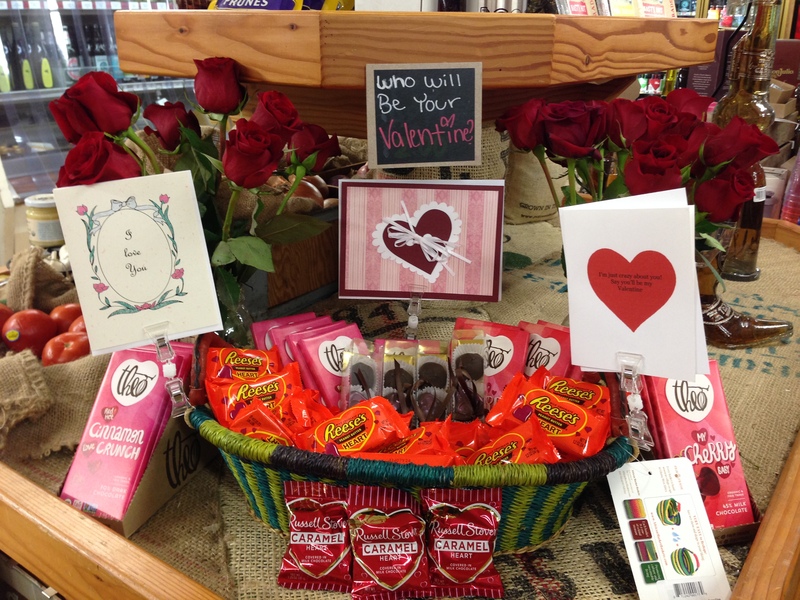 To help you select your wine and chocolate we are having a tasting Thursday February 12—just in time for V day. We will have David from Wind Rose Cellars pouring some of his great wine and we will also have some chocolate samples for tasting. It will be from 6 PM until 7PM with a cost of $5 which will be deducted from your purchase if you purchases at least $20 of wine and chocolate. Do stop by the store as it has been rearranged—the family area has moved and the alcohol is now in the front south corner of the store. Adina and her crew did a great job in getting it all moved. Hope to see you on the 12th for a glass of wine. Quilcene Village Store is ready for Thanksgiving and Christmas and one recipe. We hope you will do some of your holiday shopping with us. We have almost everything else to make your meal delicious and a little more local and organic. We don’t have turkeys—but let us know if next year you would like to order one from us. Open on Thanksgiving from 7 to noon for your last minute needs. Premade refrigerated pie crusts both regular and graham cracker. Fresh cranberries–making your own is soo easy (buying Serendipity’s is even easier) and MUCH better than canned. And of course a great selection of wines and alcohol. We have changed over to winter hours– –so please note the changes. Monday thru Thursday we are open 7 to 7. Recipe for Cass’s Better Waldorf Salad..
Fresh salad greens–I like a mix. Dressing—Seasoned Rice vinegar (available at QVS) and olive olive oil with a grating of lemon rind. Assemble the lettuce, celery, cranberries or pomegranate seeds. Top with the sliced apples, and pour dressing on the apples, add the toasted pecans and then toss. Pouring the dressing on the apples helps keep them from discoloring. adding nuts last keeps them a little crisper. Amounts and proportions are up to you. I tend to use a little more oil than vinegar but traditionally most recipes say 3 oil to 1 vinegar. I always cut the oil back from that…but the seasoned rice vinegar is very mild so you can use even less oil. Happy turkey day to you all!!! > The stores are getting some of the basics for the holidays–spices, stuffing mix, etc. We have a good selection of baskets which can be filled for lovely gifts–wine, chocolate, hand made cards, tee shirts, lip balms etc. Something to make everyone happy. > Join old and new friends in decorating the town! Come to the Christmas tree near the post office this Saturday at 8:30 AM and we will have lights to give out so we can light up the town! Come help. The following Saturday we will continue. It is great fun to do and it makes the dark nights a little brighter in Quilcene. > The official Santa lighting of the Quilcene Christmas tree will take place Saturday Dec. 6th about 5 PM. Santa will arrive, cookies and juice will be served–come join the town for a song to kick of the season! 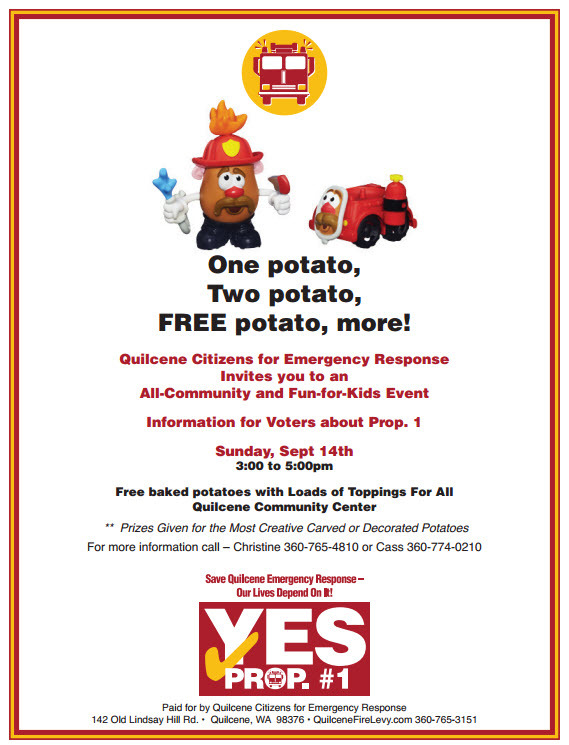 Save the date– community event Sept 14.One Potato, Two Potato, Free Potato! Quilcene Village Store is carrying produce from at least Frenetic, Dharma Ridge, Red Dog, Serendipity and Sisco (local) farms, I am so impressed with all the hard working farmers. We are fortunate to get produce grown within miles– on the day it is picked. For a small sweet treat we have six new flavors of honey sticks—at 25 cents each. And the Kezita probiotic drinks come highly rated. Discovery Bay Village Store has new flavors of ice cream including Bourbon Praline Ribbon, Mint Chip, and Blueberry Cream. They also have new hours—8 to 8 Seven days a week. Their phone number is 385-1380. QVS phone number is 765-0190.